What Does Hebrews 13:4 Mean? It is when we arrive at the epilogue of this important epistle, with its comprehensive warnings to live godly lives, not to fall short of the grace of God and to avoid the many pitfalls into which Israel fell.. that we arrive at the final section, which offers some very specific instructions on brotherly love, suffering in adversity and holy living. 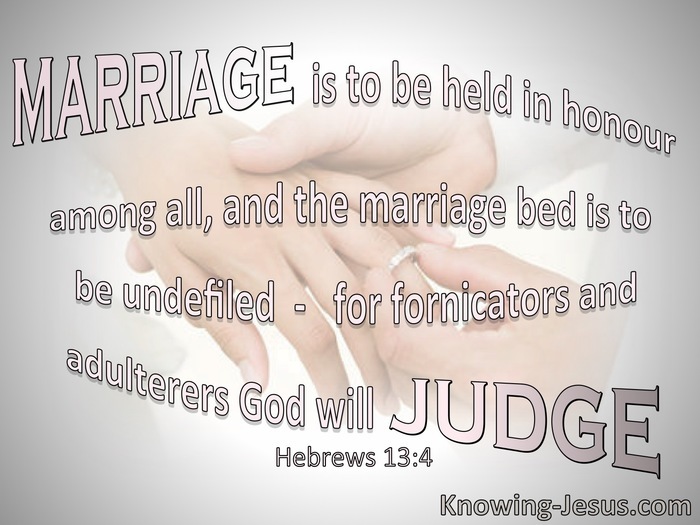 This particular verse deals with spiritual virtue and sexual purity within marriage, for we read: Marriage is to be held in honour among all, and the marriage bed is to be undefiled; for fornicators and adulterers God will judge. There is no cutting of corners or mincing of words, in this short, sharp injunction on sexual purity. This verse is very forthright in its instruction on biblical, Christian marriage, and its warnings against fornication and adultery. Marriage is an honourable estate, which was instituted by God in the beginning, for we read that a man should leave his father and mother and be united with his wife, and become one with her. 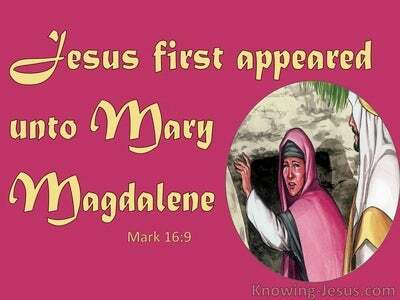 The marriage of one man with one woman was established by God, before sin entered the world, and it was pronounced to be holy by Him. Jesus confirmed that God made male and female, and said, for this cause shall a man leave his father and mother, and shall cleave to his wife; and the two shall become one flesh. The beautiful picture of Adam and his wife Eve. is used in the Bible as a type of Christ and His bride - which is the Church. Indeed, Paul reminds us of the need for personal purity, knowing that our bodies are a temple of the Holy Spirit. And here in Hebrews, the intimacy in marriage is taken into the very private quarters of the marriage bed. 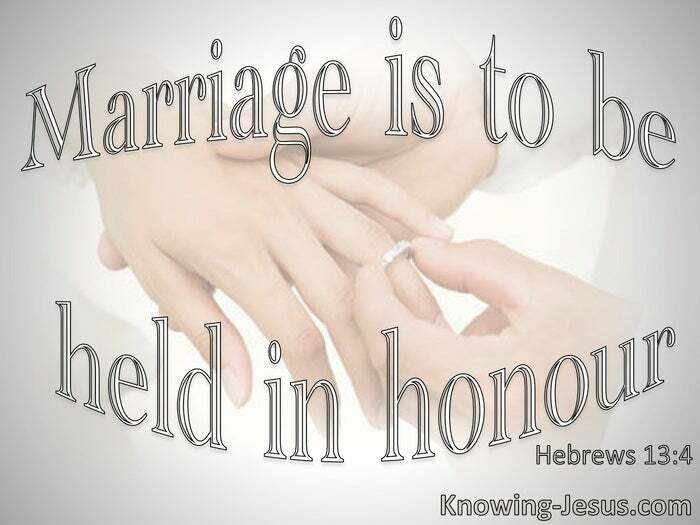 Not only is marriage to be held in honour among all, but also the marriage bed is to be undefiled. 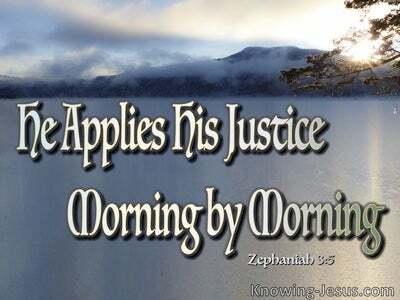 Indeed, we are warned that fornicators and adulterers will be judged by the Lord. Just as the physical act between a husband and his wife is a union of their two bodies becoming one, so the spiritual union of every believer with Christ, mirrors this same sacred union. All believers should guard against spiritual impurity, but especially in the hallowed institution of marriage.. where physical union and spiritual intimacy is woven together, in the marriage bed - representing the close affinity we all have with our Lord and heavenly Bridegroom, Jesus Christ our Saviour.